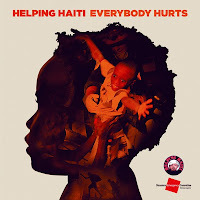 Some of the biggest names in UK and American music have joined forces to record an emotive cover of the REM classic 'Everybody Hurts', to raise money for charities supporting the relief efforts in Haiti. The line up of featured artists include; Leona Lewis, Mariah Carey, Jon Bon Jovi, Robbie Williams, Kylie, Rod Stewart, Alexandra Burke, Miley Cyrus, Take That, Joe McElderry, Cheryl Cole, JLS, Mika, Michael Bublé, James Blunt, James Morrison, Susan Boyle, and Westlife. The single will be released for download on February 7th and the CD will be released on February 8th. You can also Pre-order the CD via the following sites: Amazon , HMV and Play . The song is currently available on You Tube for sampling we give it a "Thumbs Up."